I’m so excited to be joining in on Hideous! Dreadful! Stinky!‘s Summer of No Pants again this year. 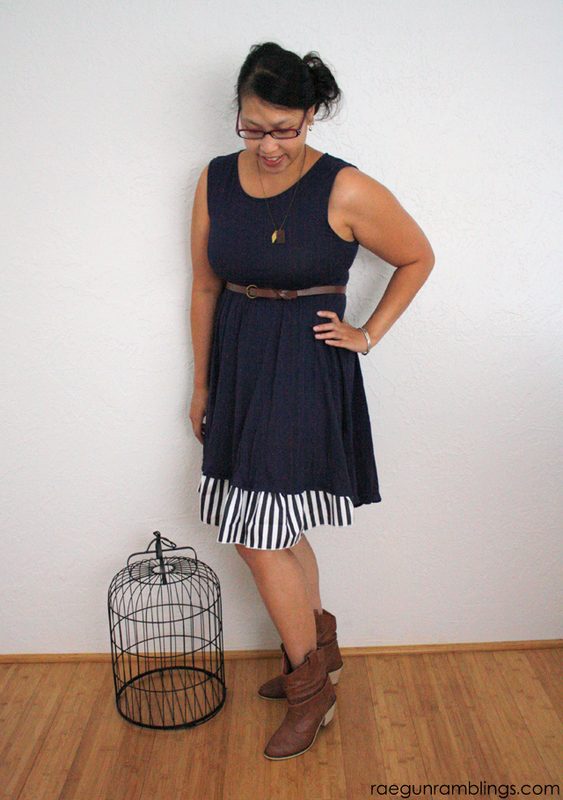 If you don’t know about SONP, Marigold challenges us to wear skirts and dresses. The series is full of fun tutorials, inspiration, tips, and more. The first year I shared an easy upcycled tank top dress and last year I made a 30 minute 1 yard of fabric skirt. This time I’m sharing and easy way to play with the high-lo skirt fashion trend even if you don’t think it’s totally for you. 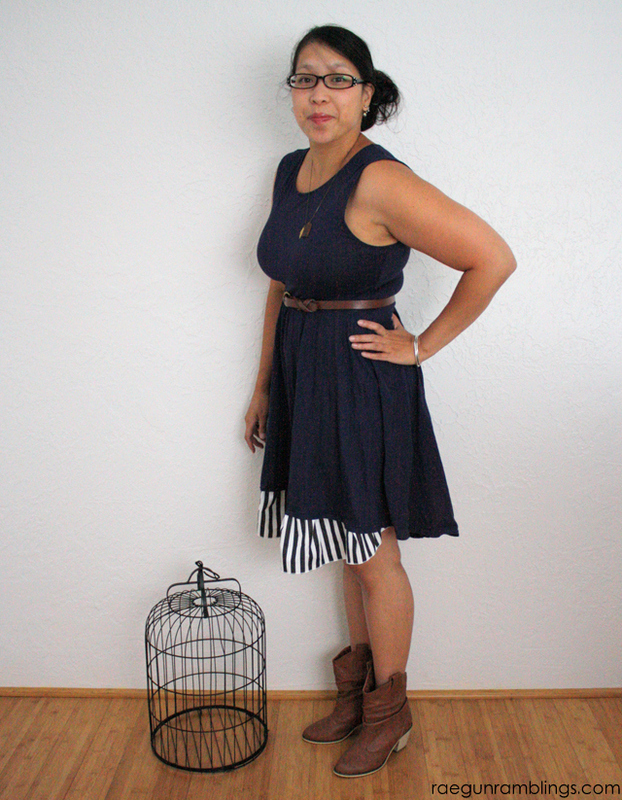 I started with this high-low dress that I got for a great deal from H&M. Unfortunately I never wore it. Every time I put it on it felt weird. Just a little too high-low if you know what I mean. So I decided to add a bit of length to the front. The result is a dress that has the high-lo feel because of the difference in fabric but is something I feel more than comfortable wearing. Even if you don’t have a high-low dress to start with you can easily trim the hem of any basic knit dress to be shorter in the front and then add a contrasting ruffle. 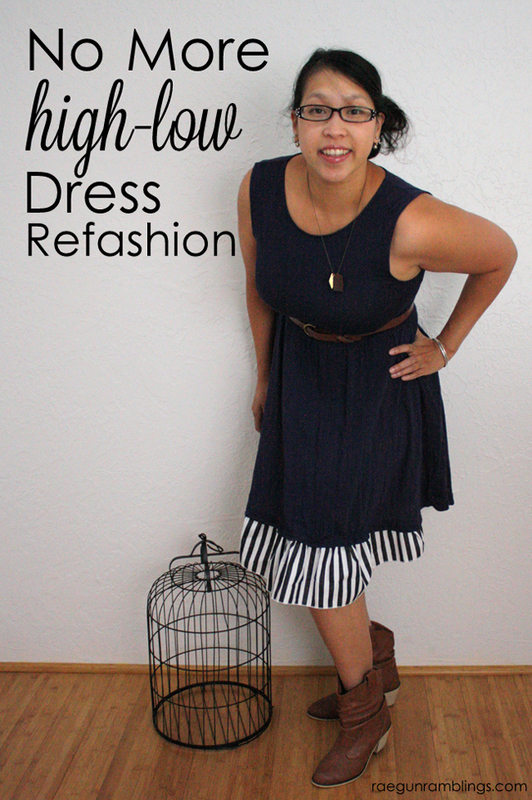 Start with a high-low dress (or skirt) or cut a regular skirt so it goes up in the front. Next measure the distance from the back of the skirt to the front. Make your ruffle 1 inch wider than that. Measure the front of the skirt and make your ruffle 1.5 X longer than that measurement. Finish the edge of your ruffle (I did a simple rolled hem). Then finish the top edge and gather. Pin the ruffle to the underside of your skirt front angling the bottom hem up like pictured above. I serged off the extra ruffle. 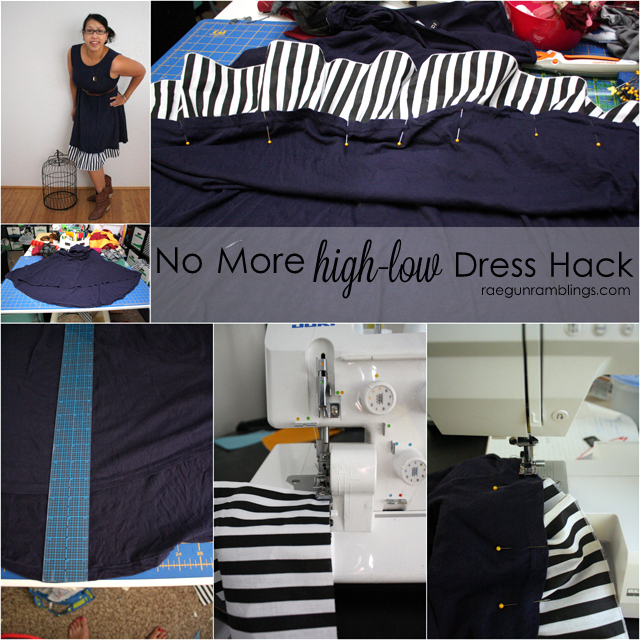 If you do this be extra careful not to catch any of the dress in the serger. Alternatively you can just tack the extra ruffle up with a few hand stitches. I really like how it turned out. 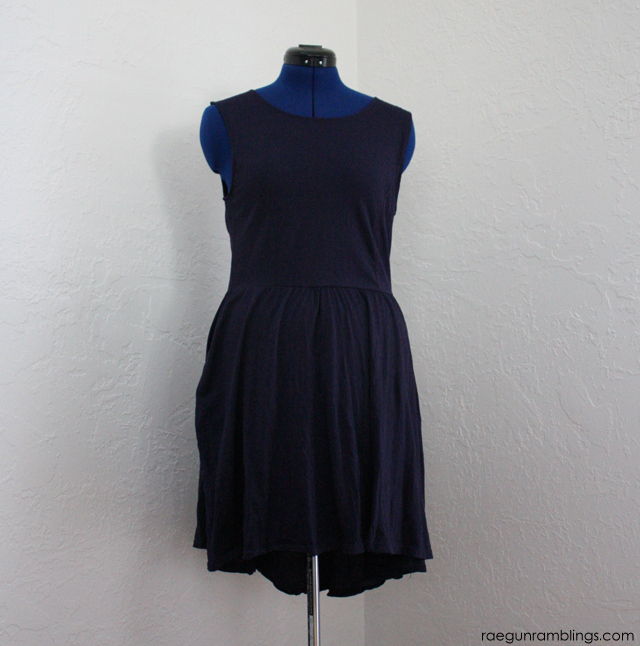 You can use the same method to lengthen any basic dress you just would have a ruffle all the way around. I had a few little photobombers. 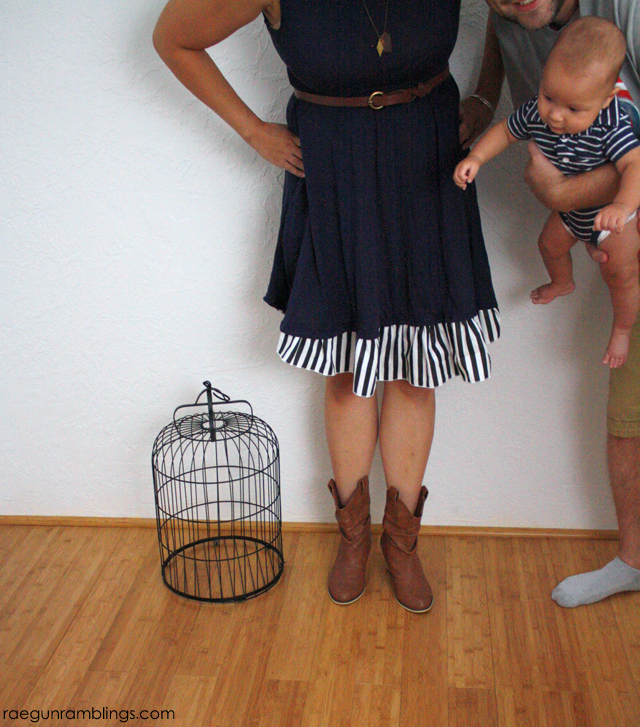 They are totally the worst photobombers EVER! But cute right? Don’t forget to stop by and check out all the other Summer of No Pants projects over at Hideous! Dreadful! Stinky! You look amazing! I absolutely love this dress! cute idea Marissa! Love the pop of interest it adds. Oh so that’s what you call those dresses. I can fix the one in my cupboard I brought then just couldn’t bring myself to wear. An absolutely brilliant idea. And it brings interest to an otherwise one color dress. It looks fab, and now you’ll actually wear it. !